. H. Aburizal Bakrie (businessman) or commonly called Ical sticking to the national stage starts from the business world. He is the eldest son of H Achmad Bakrie businessman, born in Jakarta on 15 November 1946. Now, Ical lead Bakrie Group, a group that pioneered the business his late father. The Group pioneered the business his father started from the trade of spices and plantation crops, especially from the province of Lampung. Under the control of Ical, Bakrie Group remained in existence and able to withstand the economic storms that hit this country. Before known as a leader of this business group, led Ical Indonesian Engineers Association (PII). In the business world also, he served as Chairman of KADIN Indonesia since 1994 until 2004. Position in the Chamber has been led to dwell on national issues that is greater than the problems experienced by his own company. Figure this one is a "trade mark" of his Chamber of Commerce (Chamber of Commerce and Industry). Designations were not unreasonable. During the ten year period (1994-1999 and 1999-2004) led the Chamber of Commerce, Bakrie managed to bring the employers' organization was very influential in government policy making. After leading the Indonesian Chamber of Commerce, Ical participate convention held Golkar presidential candidate in 2004 and got into seven large. Though aground, but it seems he learned how the real political game. The experience of exploring the political world was then led into one of the ministers of United Indonesia Cabinet (KiB) 2004-2009 period with a position as Coordinating Minister for Economic Affairs, and subsequently served as Coordinating Minister for People's Welfare. Ical been touted as the richest man as Southeast Asia. He spelled out the most brilliant entrepreneurs in the ten years of reform in Indonesia. In addition to get out of the economic crisis that threatens his company, Bakrie Group, and thus can occupy an important position in government. Bakrie family had also been named by Forbes Asia magazine as the richest man in Indonesia in 2007. He did not argue, but also did not respond to excess. What is the secret of this successful family business? NEWS scene was blowing in from Singapore. From the Lion's Affairs, the Asian edition of Forbes magazine's December 13, 2007 quoted. Its contents, like in previous years, displaying a list of those super-tajir aka the wealthiest of Indonesia. And that makes a scene, jawaranya for this year is Bakrie, businessmen as well as politicians who had slumped during the economic crisis a decade ago. Many people gasped. How could Ical-familiar call-that previously Aburizal still in sixth with wealth of U.S. $ 1.2 billion, is now poking into the top? The answer, according to Forbes' research results, lies in its ability to multiply his money purse. Within a year, Bakrie family fortune soared to nearly five times the figure last year to U.S. $ 5.4 billion, or around Rp 50.2 trillion! Thanks to this achievement, tycoon Aburizal directly displacing the top five at once. Bos Raja Garuda Mas Group, Sukanto Tanoto, which last year crowned as the richest man, now fell one place to the runner-up sequence. A number of colleagues directly Aburizal welcomed with joy the announcement that Forbes. Vice President (then) Vice President Jusuf Kalla and Chairman of the Indonesian Indigenous Businessmen Association, Suryo B. Sulisto, among them. "Do not forget, for the first time in Indonesian history, the richest man is occupied by indigenous entrepreneurs," said Kalla. Bakrie Group is fortunate indeed. According to an investment banker, this business group benefited from two blessings at once: that soaring commodity prices in world markets and the rush of global investors in the Asia-Pacific capital markets. That is why the stock index at a number of exchanges in this region the average shot 27 percent so far this year. BursaIndonesia even expected to grow to 52 percent. PT Bumi Resources Tbk. including a business unit of Bakrie Group, which ketiban windfall. Largest coal producer in Indonesia is like a windfall. Coal prices, product jualannya, rocketed from U.S. $ 50 per ton at the end of 2006 to U.S. $ 90 per tonne at the end of this year. "This trend sparked by soaring demand from China and India," said Poltak Hotradero, an analyst with Recapital Asset Management. With revenues doubled, the stock increasingly kinclong Earth. Investors were chasing the stock exchange floor. Consequently, only in a year, its stock price rose six-fold, from Rp 920 per share at the end of last year to USD 6000 per 26 December. By default, market capitalization of the Earth also soared to Rp 116.4 trillion, the second largest after PT Telekomunikasi Indonesia. Bakrie family as owners of 40 percent stake would come sumringah Earth. Dikantonginya shares are now valued at Rp 47 trillion in cash. This means that more than 90 percent of the total wealth Forbes estimated at about Rp 50.2 trillion comes from the ownership of these shares of mining companies. "This is evidence of growing confidence," said Aburizal in Jimbaran, Bali. That is just the shares of the Earth. These families still have other money in the stock mines Indonesia. PT Bakrieland Development share price rose 223 percent, PT Energi Mega Persada, 190 percent, PT Bakrie Sumatra Plantations 126 percent, PT Bakrie & Brothers 96 percent and 75 percent of PT Bakrie Telecom. Generally, this family became majority owner in these public companies. So what's the secret behind the triumph of the Bakrie Group? Several analysts and executives from the business group said the key lies in the mastery of time management saw the opportunity and decision making. According Suryo Sulisto, President Commissioner of Bumi Resources, was not separated from the rapid movement of the Bakrie Group hijack the highly skilled professionals, from within and abroad, to occupy the core position of management. There is also another answer behind the rise of the Bakrie business. In the eyes of economists Dradjad Wibowo, Bakrie's success is a combination of three things: luck, skill to read the market, and proximity to the circumference of power. An investment banker to add one factor: luck. Bakrie shrewdness opportunity to steal business from competitors no doubt about it. Just remember when fighting over shares of Bakrie's largest coal producer in Indonesia, Kaltim Prima Coal (KPC). At that time, Nirwan Bakrie, Bakrie Group, the main operator who is also brother Aburizal, hard fought fight with David Salim KPC shares owned by Rio Tinto and BP Plc. In fact, it was David seconded by the central government and regional governments in East Kalimantan. According to sources involved in this transaction, to streamline the acquisition, they lobbied officials. In addition, Nirwan with Ari S. Hudaya and Nalinkant Rathod from Earth Resources also sought to convince investors. They were guerrilla to Singapore, London, to New York. The result, they get funding from Credit Suisse First Boston (CSFB) and United Overseas Bank (UOB). As a result, at a price of U.S. $ 500 million, the Earth is twisted his rival's success. KPC controversial transaction marks the resurrection of the Bakrie Group, the Indonesian business world. In fact, the economic crisis in 1998 nearly destroy a business empire which was pioneered by Achmad Bakrie, Aburizal father, since the 1942's. As a result of crises, the Bakrie family must be willing to stay pocketed 2.5 percent stake in Bakrie & Brothers to complete the debt restructuring with its creditors. However, from there the Bakrie Group business empire was finally able to bounce back. Various steps of acquisitions and business expansion continues and even encouraged. His business expanded into the lucrative sector, from oil palm plantation business to property projects. They are too busy chasing new oil fields and mines. Earth, for example, currently occupied by a planned acquisition of Herald Resources worth U.S. $ 455 million. Herald was working on the Dairi project, lead and zinc mine in North Sumatra. "We are optimistic that a successful transaction," said Dileep Srivastava, senior vice president of Investor Relations of the Earth. They also expanded into new businesses. 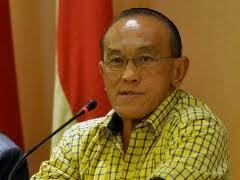 Bakrie began to enter the telecommunications sector, highway to drinking water. In the telecommunications business, they're actively expanding telecommunications network of Esia, products, outside of Java. This business group is also actively working on the toll road concession-Pejagan Kanci, part of the Trans-Java toll project. Roads are not always smooth. Efforts to hunt down the oil in the Brantas Block, Sidoarjo, East Java, in fact led to disastrous. In May 2006, in areas of drilling wells owned by Lapindo Brantas Inc.., Its business units, it came out hot mudflow. These disasters made more than 10 thousand people evacuated and 400 hectares of submerged lands, including paddy fields, houses, factories and schools. East Java had paralyzed economic. Direct accusation leads to the Bakrie Group, which was considered negligent in performing drilling. Bakrie company is one of the largest companies in Indonesia, and now his talent as a businessman he was sent down to his children.